The Talbots Inc is a direct marketer and retailer of women's shoes, classic, and other fashion accessories. With its headquarters in Hingham, Massachusetts, the company as established in 1947, and it primarily offers products such as t-shirts, trench, blazer, pearls, and ballet flats. Almost seventy percent of the direct business comprise of online sales. Presently, there are over five hundred brand stores in 46 states in U.S. and it employs about 8,500 associates. Nancy and Rudolf Talbot opened the first shop of the company in 1947. In 1948, the company started its direct mail business. In 2012, Sycamore Partners acquired the company. 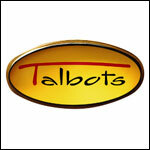 There are currently 3 consumer reviews about The Talbots Inc available. Share your review. I have shopped at Talbots for over 40-years but will no longer be one of their loyal customers. The last few purchases I have made have been expensive while the quality is the same as it had been in the past. Their prices have increased significantly and no longer matches the quality I have come to expect. Their customer service used to be outstanding and it too is on the decline. Too bad for a company that has been around so long. If you follow their stock, it has been on a steady decline and they have had to close many stores across the country. Perhaps their low quality, high prices and lack of customer service are the reasons for their steady fall. Please take a note that you are about to post a public review about The Talbots Inc corporate office on CorporateOffice.com. This review will be public, so please do not post any of your personal information on this website. If you would like to contact the corporate offices of The Talbots Inc, please use their contact information such as their phone number, website, and address listed above to contact them. However, sometimes staff from The Talbots Inc headquarters do read the reviews on this website.